The Art of Feeling is a YA romance/drama by Laura Tims about pain, emotional and physical, and the different effects it has on two foils: a girl with chronic pain, and a boy with congenital analgesia. The book’s protagonist is a young girl named Samantha Herring who, just prior to the book’s beginning, survived a car accident that left her with a devastating leg injury, killed her mother, and left her spiraling into depression. The Tragic Heroine trope utilized throughout the book, though unoriginal, was very well handled. Sam is a witty and scrappy protagonist, and she handles her dismal circumstances with grit. She makes a few stupid decisions throughout the book, which serve as very obvious plot devices; but, aside from a few inconsistencies, Tims’ competence as a writer really shines in Sam’s character development. Sam was truly a breath of fresh air after some of the other YA romance/drama novels I have reviewed this year. The deuteragonist is a boy named Eliot, whom the book describes as “a reckless loner with a carefree attitude.” His inability to feel pain is certainly a crutch for his character, as he didn’t have nearly the personality nor development that Sam had. All in all though, he was a fairly engaging character, and he also felt strikingly authentic, which, again, is not a character trait that one often encounters in the YA romance world of Mr. Perfect, Popular Jock, and Mr. Angsty, Werewolf Bad Boy. My only real issue with this book in terms of characters came in the form of the book’s main antagonist, which I can’t say too much about without major spoilers, but who I can say felt horribly exaggerated and cartoon-like. The book’s plot took some strange turns, and it often felt as though Tims was trying to cram too much into the story. The book focuses far too heavily on the mystery surrounding Sam’s mother’s death. At certain points, I was under the impression that Tims forgot what The Art of Feeling was about and tried to turn it into some kind of bizarre crime/mystery novel. The result is messy and significantly detracts from the real star of the book: the character dynamics. I don’t have a strong opinion on Tims’ writing style (which I suppose is actually an opinion in itself). Her writing style was generic, but not offensively so. It did not compel me nor did it detract too significantly from the book. The dynamic between Sam and Eliot was this book’s saving grace. The Art of Feeling emphasizes the friendship between the two instead of shoving romance down your throat (even now I’m still not sure if the characters were actually in love despite the book being advertised as romance), and can consequently be enjoyed even by people like myself who generally don’t reach for romance novels. And although, as said before, Tims’ writing style wasn’t excellent, she absolutely nailed the banter between the two. I found myself actually chuckling at a few of their lines, which was surprising considering the book’s themes of death and pain. 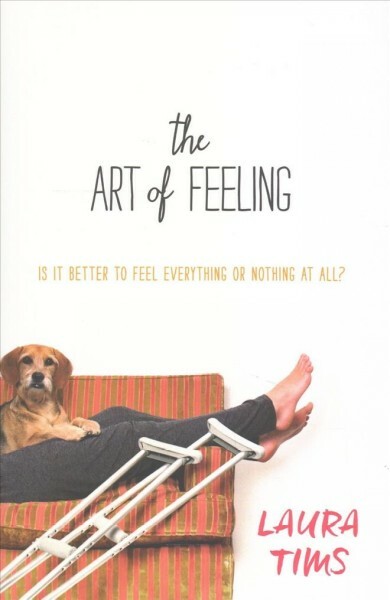 The Art of Feeling had a great premise but a somewhat poorly executed plot; it had some excellent characters and some that felt corny beyond belief. I would have given this book a 2.5 had it not been for the excellently-handled relationship between the two main characters, which kept me charmed until the end of the story. 4 stars.